Hey folks... New Action Features here! What is in this one? Lots of stuff. James & Mike share their thoughts on things like the Star Wars Episode VIII rescheduling, the Terminator Genisys film, and various snack foods provided by Mike's Mom. They then spend the latter half of the show with a Top Five list featuring toy lines that they feel ended too soon. Doesn't seem like much to go on... but they somehow squeezed an hour out of this episode. How did they do it? Get your ears on and find out! Time for Action Features. Welcome to the NECA Classic Planet of the Apes Subscription Model Investigation Proposal! The goal of this proposal is to convince NECA Toys that there is enough support for a Classic Planet of the Apes Figure Subscription for them to investigate pursuing this method to continue the toy line. While voting in the poll at the close of this proposal is no guarantee that anything will ever happen with the line over at NECA Toys, it will hopefully express our receptiveness to a subscription sales model in an actual numerical representation. This petition is not endorsed or affiliated with NECA Toys. It is produced by fans and should not be seen as an official NECA proposal. All opinions and data herein are presented by the author and not NECA Toys. 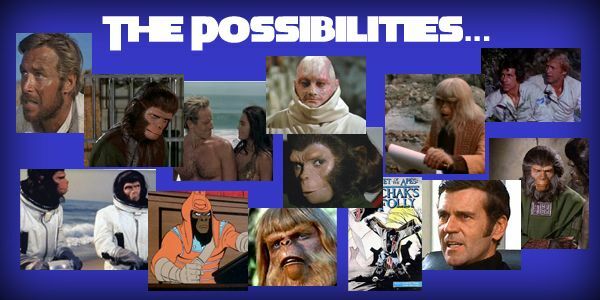 If you are reading this proposal, you probably have at least some knowledge of NECA’s Classic Planet of the Apes; many, however, may not be aware that the line has in all likelihood ended. While NECA and the Apes fans had high hopes at its inception (with some at the company hoping for it to be akin to their long-running Predator series), the line suffered from a lack of support at the retail level. Two waves were produced at mass-market retail (along with various single release items), with a third wave set for release in 2015. Declining sales forced NECA to find a different way to release the third wave, so an exclusive bundle of all three figures was produced for sale at San Diego Comic-Con, Toys R Us, and Hastings stores. It was hoped that producing them in this manner might create a new way to sell the line; guaranteeing sales on an entire wave all at once instead of counting on all 3 figures to sell in equally in adequate numbers. Unfortunately, sales for the Apes 3-pack were the lowest of all the NECA exclusives and the line was put on indefinite hiatus. With the failure at a retail level, many fans have tried to come up with different ways for the line to continue; everything from Kickstarter to convention exclusives to pairing them in 2-packs with NECA’s other successful lines. The most viable option however would seem to be a subscription-based model like Mattel’s Masters of the Universe Classics line. 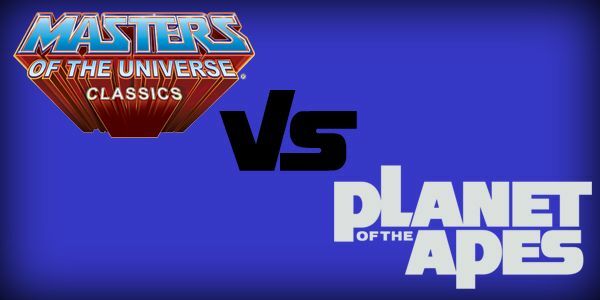 For those unfamiliar with Mattel’s Master of the Universe Classics subscription, here is a brief overview: Back in 2008, Mattel began an effort to bring Masters of the Universe back to toy shelves… but not the shelves of an actual store. The shelves they referred to were those of collectors’ homes, since this new toy line would avoid mass-market retail and instead be released as monthly figures available through Mattel’s new venture- MattyCollector.com. The reasoning behind this was twofold. First and foremost, Masters of the Universe had attempted a comeback earlier in the decade which had failed to work at the retail level. The failure of the line caused Mattel to be hesitant on trying anything with the license at retail again, due to the high cost of developing and bringing a line to mass-market stores. But if the figures were produced in lower numbers and released one at a time through their own website, the plug could be pulled at any time with very little financial risk (and potential loss) for Mattel. Releasing the figures in this way would also solve a second problem- one belonging to the consumers and not Mattel. The He-Man line of 2001 was somewhat of a chore for many to collect due to the rarity of many of the figures produced. Figures based on secondary characters were scarce at one per case assortment, while an overabundance of He-Man and Skeletor clogged the shelves. Selling the figures through the website would solve this problem, allowing everyone equal access to the entire line. Eventually, the standard website sales of the Masters of the Universe Classics & other Mattycollector.com lines necessitated a change in how these figures were offered. Instead of taking the risk on “day-of” sales (especially with lesser-known characters), Mattel needed a guaranteed amount of yearly sales for the line to continue. Thus the Masters of the Universe Classics Subscription program was born. Each year, Mattel would sell a subscription to the figure line for the following year. Buyers were enticed with reveals of only certain figures from the 6-12 that would be available in the subscription (at either a monthly or bi-monthly schedule). A subscription fee would be paid at the time of signing up equal to the cost of one figure. In exchange for “buying” the sub, the purchaser would receive one “free” figure exclusive to those who subscribed. The line would only continue into the following year if a certain amount of sub sales were made. If sub sales were succesful, the buyer would be guaranteed each figure promised through the subscription, with certain figures from the sub also being available to purchase through the Mattycollector.com website (albeit at a price higher than that paid by subscribers). If the number of subscription sales wasn’t hit during the window of opportunity, the line was cancelled and your sub money was refunded. While the sub model wasn’t able to save every line released at Mattycollector.com, it has proved VERY successful for the Masters of the Universe Classics line. It has lasted 8 years, with hundreds of figures, beasts, vehicles, and playsets now in the hands of collectors. 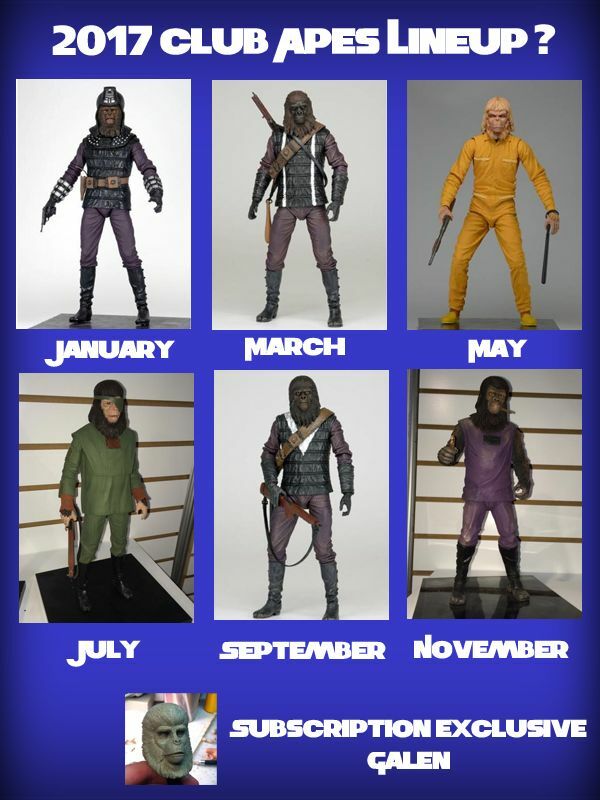 NECA may not even be equipped to run a monthly or bi-monthly subscription service for the Classic Planet of the Apes line, but it would seem the best venue to explore for the line’s continuation. 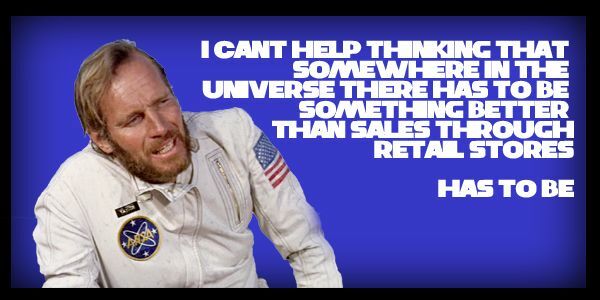 There is no risk of retail failure with this model, and a guaranteed number of sub sales would have to be hit to get the minimum quota needed for production. If the number isn’t hit, then that is it. The Apes line will truly have ended. While comparing NECA’s Apes with Mattel’s He-Man line is great in regards to the validity of the sub, it isn’t as fair when it comes to popularity. The fans buying the Masters of the Universe Classics line are fervent and outnumber the Apes fans actually purchasing NECA’s line by a large margin. This large audience allows Mattel to hit the number of guaranteed sales they need to keep the figures at a cost of around $25-$30 per standard figure. In the toy production world, the higher the number you produce means the lower your cost of production per unit will be. So for a line like NECA’s Planet of the Apes (whose subs sales won’t come close to cracking the Masters of the Universe Classics numbers), buyers should expect a higher cost per figure than Mattel’s Masters of the Universe Classics due to the lower production numbers. Mattel’s Masters of the Universe Classics line also relies very heavily on a number of “buck” bodies, meaning very little tooling dollars involved with many of their releases to keep production costs low. NECA does not have this same luxury. The Apes figures do share many parts, but the amount of added tooling in each release and the overall high quality of paint and materials used means that these figures almost assuredly have a higher cost of production. In order to maintain this quality on a smaller production run, the price of the figures would need to be raised accordingly. Given all this, it isn’t unrealistic to expect figures in a NECA Classic Planet of the Apes sub to possibly carry a cost of $40-$50 each through the subscription, with any figures released on their website separately being $50 or more. While this may seem a solid jump over the $27 per figure cost of Mattel’s Masters of the Universe Classic line (and it is always possible NECA might be able to offer them cheaper than my estimation), we know that Apes fans are way more passionate & vocal than they are numerous by how the line preformed at retail. We have to go into a subscription knowing that it isn’t going to sell in large numbers in all likelihood. But… if it were the only option to get at least a few more figures released, I believe many diehard Apes fans would be willing to pay this price. After all, collectors pay these prices and more each year to attain convention and retail exclusives on the secondary market. When you get to the poll section of this post, you'll note that there are 2 pricing options included: The more realistic price of $40-$50 per figure, and a "more hopeful" price of $30-$40. If you are only willing to spend that $30-$40, please choose only those applicable options. If you are willing to go up to the $40-$50 range, please choose BOTH the $30-$40 AND $40-$50 options! While I don't believe there are enough fans out there who would purchase the amount of figures needed to get the production costs low enough for that $30-$40 price point, I want to make sure that the folks willing to spend anywhere from $30 up to $50 are included in both options! This would seem like a favorable breakdown of the Apes figures already in development. Lead with a strong fan-favorite like Urko (which requires a minimum of new tooling), space out the similar figures of the TV Gorilla Soldiers, make the figure most similar to an existing figure (Galen) the exclusive, and save the most desirable figure (Julius) until the end to keep buyers interested and excited about the sub all year. If this proposed subscription moves forward, the overall success of the first endeavor could lead to many undeveloped, fan-requested characters happening in the following years. Meaning that if we can make this model work, figures like Taylor, Nova, Milo, the Apeonauts, Virgil, the Lawgiver and many more might have chance at production! ...And who knows- If this sub model works for NECA, it may even help them take a look at a few other lines that didn't work out at retail stores. 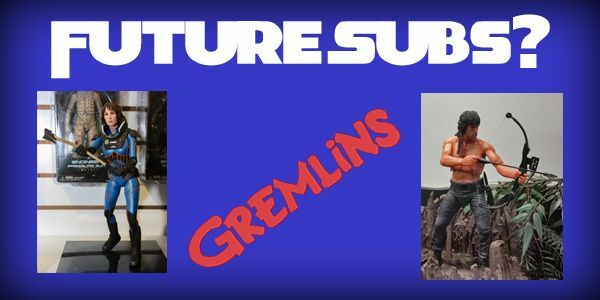 Things like the unproduced wave of Prometheus, more Gremlins, and Bow Attack Rambo could find new life through NECA Club preorders! Now that you've made it through all the explanation, here comes that part where you get to take action! First- Fill out the poll below. Please keep in mind that you need to pick ALL options that apply to you! For example- If you are up for buying 2 subscriptions at the $40-$50 price range, you would choose ALL 4 of the first options. If you are up for only 1 sub at the $40-$50 range, but would buy 2 if they were priced at $30-$40, you would choose only the first 3 options. Got it? If not, feel free to e-mail me at NecaApes@gmail.com and I will help explain it further. PLEASE MAKE YOUR SELECTIONS HONEST AND VOTE ONLY ONCE! After finishing the poll, PLEASE share this post! If you have a toy website, please post a link... Visit a toy forum? Post it there! Share it on Facebook, twiiter, instagram, or whichever social media you prefer. And when you do so, use the hashtag #SubTheApes so we can all find it! Remember- The more Apes fans that see this post and get active on this proposal, the better it will look! So get out there... and FIGHT LIKE APES!